Team  Bowl eligible for the 12th consecutive year, second longest streak in Clemson history.  Led the ACC in home football attendance and ranked in the top 20 in the nation for the 30th consecutive year.  Played most difficult schedule in Clemson history in terms of opponents who went to bowl games (10) and teams that finished with winning records (9).  Clemson was the only team to take top ranked and undefeated Auburn to overtime.  Senior class finished with 31 wins, including 15 over teams that went to bowl games and 14 who finished season with winning record. 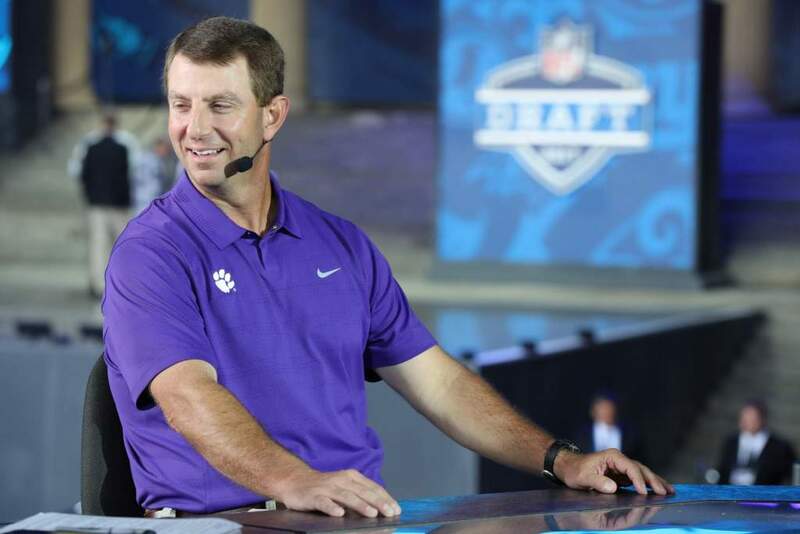  Head Coach Dabo Swinney has 982 APR score for his career as a head coach, third best among active FBS head coaches. Offense  Running back Andre Ellington finished second in the ACC in touchdowns per game with 12 in nine games.  Jamie Harper finished with 35 receptions, second most in Clemson history by a running back.  Ellington and Harper each scored at least 10 touchdowns, joining James Davis and C.J. Spiller (2006, 2008) as the only Clemson running back duos to both score at least 10 touchdowns in the same season.  Ellington established Clemson career record for yards/carry with 6.33 average.  Freshman wide receiver DeAndre Hopkins earned third-team Freshman All-America honors by Rivals.com and was a first-team All-ACC freshman selection. He had 52 receptions for the year, second best by any freshman in school history. He established Clemson true freshman record for receptions and reception yards.  Hopkins was one of just five freshmen nationally to record at least 50 receptions in 2010.  At midseason, the Clemson offense went three consecutive games and 238 consecutive plays without a turnover, longest streak in Clemson history.  Starting offensive tackle Chris Hairston was named first-team All-ACC.  Quarterback Kyle Parker became just the fifth player in Clemson history with at least 400 career completions, 30 touchdowns and 4,700 passing yards.  Tight end Dwayne Allen was a midseason selection for the John Mackey Award, which is given to the top tight end in the nation. He was a second-team All-ACC selection at season’s end.  Tight end Brandon Ford had two touchdown catches in the Meineke Car Care Bowl, the first Clemson receiver with two TDs in a bowl game in school history.  Clemson senior receiver Xavier Dye was named one of three finalists for the John Wooten National Leadership Award. Defense  Da’Quan Bowers won Bronko Nagurski Award as the nation’s top defensive player as chosen by the Football Writers Association.  Bowers also won the Ted Hendricks Award as the nation’s top defensive end and was a finalist for the Lombardi Award and the Bednarik Award.  Bowers was named first-team unanimous All-American, just the fourth unanimous All-American in Clemson history, and was named ACC Defensive Player of the Year.  Bowers led the nation in sacks with 15.5, second most in Clemson history and ranked second in the nation in tackles for loss with 26. He set Clemson record by being involved in a sack in nine straight games.  Top tackler DeAndre McDaniel named third-team All-American and finished second in Clemson history in career interceptions with 15. He was third among active FBS players at the end of his career.  Defensive tackle Jarvis Jenkins established Clemson record for career blocked kicks with four.  Clemson had three first-team All-ACC players on defense in Bowers, McDaniel and senior tackle Jarvis Jenkins. Clemson was the only ACC school with three first-team selections.  Clemson assistant coaches Chris Rumph were both named finalists (two of just four) for the National Defensive Line Coach of the Year by FootballScoop.com.  Ranked fifth in the nation in rushing touchdowns allowed, ninth in the nation in tackles for loss, 13th in the nation in scoring defense, 19th in total defense, and 23rd in pass defense.  Clemson led the ACC in scoring defense.  Punter Dawson Zimmerman was one of 10 semifinalists for the Ray Guy Award, the only ACC player selected. He recorded two of the four longest punts in Clemson history in 2010 (79 and 76 yards), and his net punting average of 51.0 against North Texas established a Clemson single game record.